Hailed as a prodigy, Dr.Shobana Vignesh is considered one of the leading performing and recording Carnatic musicians in India. She has both musical legacy and phenomenal talent. Schooled in the Carnatic system of music by stalwarts in the field like Sri Swamimalai Janakiraman, Sri. P.S. Narayanaswamy and Prof. T.R. Subramaniam from the age of five, Shobana had already stunned thousands with her prodigious talent by the time she touched her teens. Her most recent and notable achievement has been the honor of receiving the ‘Individual Artist Award’ for 2010 from the Maryland State Arts Council, USA and a citation from the Governor of Maryland, USA for her artistic excellence in the field of Carnatic music. She is fondly known as ‘Mahanadhi’ Shobana for her brilliant performance as a child actor and singer in the National award winning movie ‘Mahanadhi’ in the year 1994. She has blossomed from a child prodigy into one of the most valuable and versatile artistes in the music field. Shobana made her recording debut at the tender age of 13 and since then has released more than 130 albums ranging over 1500 songs in various Indian languages. 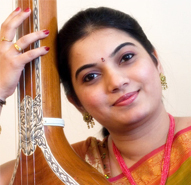 She is one of the top selling artists of Carnatic and Devotional music in India. Vocalist Mahanadhi Shobana’s voice has an inherent blend of sweetness and depth. She displays an astonishingly expressive range, acquired no doubt through meticulous training and practice. This research scholar in music, tutored by Swamimalai Janakiraman and Prof. T.R. Subramaniam, has a touch of class and polish in her delivery. As an internationally renowned artist, Shobana has performed in several parts of India, Singapore, Malaysia, Srilanka and the United States. She is also often featured by many leading Television channels in India and other countries and has been performing concerts for them for the last 17 years. With the unique rendition of traditional and time-honored Carnatic music pieces and popular numbers from her albums, Shobana enthralls her audience with her rich and mellifluous voice. Her crystal clear diction and high aesthetic delivery highlights the emotive and expressive quality of South Indian Classical music and adds a very significant facet to her performances leaving audiences spellbound. Apart from being a leading performing artist, Shobana is a research scholar in music and has several music publications to her credit and two of them have been adapted as book chapters. She has a Doctoral Degree in Music and 3 Masters Degrees. Her lecture demonstrations on Carnatic Classical Music are well received and she captures her audience with her in-depth knowledge in the field and her practical experience as a performer. Awarded the title, 'Tamizhisai Vani' by Atlanta Tamil Sangam, USA in May, 2011 for spreading Tamil music across the globe. Received the ‘Individual Artist Award’ from the Maryland State Arts Council, USA for excellence in Carnatic Music for 2010. Awarded the fellowship for ‘OUTSTANDING YOUNG ARTISTE’ by the Department of Culture, Government of India from 2003-2005. Received Rukmani Ramanathan Memorial Special Award for ‘EXCELLENCE IN CARNATIC MUSIC’ for the year 1999 from Padma Seshadri Bala Bhavan Senior Secondary School, Chennai. Recipient of CULTURAL SCHOLARSHIP awarded by Bharat Kalachar, Chennai, India from 1991-1999. Awarded the title of PANNISAI ARASI by Thamizh Isai Sangam, Thiruvaiyaru in 1997. Was conferred the title of EZHIL ISAI VANI by Vani Vilas Sabha, Kumbakonam in 1996. Recipient of the CCRT SCHOLARSHIP (Center for Cultural Resource and Talent) from the Ministry of Culture, Government of India from 1994-2001.